Cinnamomum tamala, Indian bay leaf', also known as ತಮಾಲ (Tamaala) in Kannada(ಕನ್ನಡ), மரப்பட்டை இலை (Pattai Illai) in தமிழ்(Tamizh), tejpat, tejapatta, Malabar leaf, Indian bark, Indian cassia, or malabathrum, is a tree in the Lauraceae family that is native to India, Bangladesh, Nepal, Bhutan, and China. It can grow up to 20 m (66 ft) tall. Its leaves have a clove-like aroma with a hint of peppery taste, they are used for culinary and medicinal purposes. It is thought to have been one of the major sources of the medicinal plant leaves known in classic and medieval times as malabathrum (or malobathrum). Cinnamomum cassia D.Don nom. illeg. Cinnamomum pauciflorum var. tazia (Buch.-Ham.) Meisn. The leaves, known as tējapattā or tejpatta (तेजपत्ता) in Hindi, tejpat (तेजपात) in Nepali, Maithili and Assamese, tejpata (তেজপাতা) in Bengali, vazhanayila (വഴനയില) in Malayalam, and tamalpatra (तमालपत्र) in Marathi and in original Sanskrit, are used extensively in the cuisines of India, Nepal, and Bhutan, particularly in the Moghul cuisine of North India and Nepal and in tsheringma herbal tea in Bhutan. It is called biryani aaku or bagharakku in Telugu. It is often used in kumbilappam or chakka-ada (ചക്ക അട), an authentic sweet from Kerala, infusing its characteristic flavor to the dumplings. They are often labeled as "Indian bay leaves," or just "bay leaf", causing confusion with the leaf from the bay laurel, a tree of Mediterranean origin in a different genus; the appearance and aroma of the two are quite different. 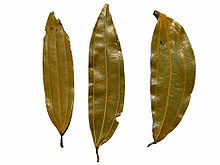 Bay laurel leaves are shorter and light- to medium-green in color, with one large vein down the length of the leaf, while tejpat leaves are about twice as long and wider, usually olive green in color, with three veins down the length of the leaf. There are five types of tejpat leaves and they impart a strong cassia- or cinnamon-like aroma to dishes, while the bay laurel leaf's aroma is more reminiscent of pine and lemon. The bark is sometimes used for cooking, although it is regarded as inferior to true cinnamon or cassia. Methanolic extract of C. tamala leaves fed at 10 mg/kg to alloxan-induced diabetic rats for 15 days resulted in significant reduction in blood glucose level, blood glycosylated haemoglobin, LPO, serum AST, and ALT, and significant increase in the antioxidant enzymes such as CAT, GSH, and SOD. C. tamala could be used as an adjunct therapy in diabetes. Malabar had been traditionally used to denote the west coast of Southern India that forms the present-day state of Kerala and adjoining areas. The word mala or malaya means "mountain" in the Tamil and Malayalam languages, as also in Sanskrit. The word "malabathrum" is thought to have been derived from the Sanskrit tamālapattram (तमालपत्त्रम्), literally meaning "dark-tree leaves". ^ a b c d "Cinnamomum tamala". Germplasm Resources Information Network (GRIN). Agricultural Research Service (ARS), United States Department of Agriculture (USDA). Retrieved 12 December 2017. ^ Xi-wen Li, Jie Li & Henk van der Werff. "Cinnamomum tamala". Flora of China. Missouri Botanical Garden, St. Louis, MO & Harvard University Herbaria, Cambridge, MA. Retrieved 29 March 2013. ^ Umberto Quattrocchi (2016). CRC World Dictionary of Medicinal and Poisonous Plants: Common Names, Scientific Names, Eponyms, Synonyms, and Etymology (5 Volume Set). CRC Press. pp. 959+. ISBN 978-1-4822-5064-0. ^ P. N. Ravindran; K Nirmal-Babu; M Shylaja (29 December 2003). Cinnamon and Cassia: The Genus Cinnamomum. CRC Press. pp. 199+. ISBN 978-0-203-59087-4. ^ a b Ahmed, Aftab; Choudhary, M. Iqbal; Farooq, Afgan; Demirci, Betül; Demirci, Fatih; Can Başer, K. Hüsnü; et al. (2000). "Essential oil constituents of the spice Cinnamomum tamala (Ham.) Nees & Eberm". Flavour and Fragrance Journal. 15 (6): 388–390. doi:10.1002/1099-1026(200011/12)15:6<388::AID-FFJ928>3.0.CO;2-F.
^ Dighe, V. V.; Gursale, A. A.; Sane, R. T.; Menon, S.; Patel, P. H.; et al. (2005). "Quantitative Determination of Eugenol from Cinnamomum tamala Nees and Eberm. Leaf Powder and Polyherbal Formulation Using Reverse Phase Liquid Chromatography". Chromatographia. 61 (9–10): 443–446. doi:10.1365/s10337-005-0527-6. ^ Rao, Chandana Venkateswara; Vijayakumar, M; Sairam, K; Kumar, V; et al. (2008). "Antidiarrhoeal activity of the standardised extract of Cinnamomum tamala in experimental rats". Journal of Natural Medicines. 62 (4): 396–402. doi:10.1007/s11418-008-0258-8. PMID 18493839. ^ (Indian Vet. J. June 2012, 89(6): 72-74). Wikimedia Commons has media related to Cinnamomum tamala.